In 1779, frigate Hermione (air-mee-OHN) was the sleek French warship that carried General Lafayette to America in 1780, a voyage that directly culminated in the American-French victory at Yorktown in 1781. The current Hermione is an authentically built replica, launched last year and in May 2015 sailed to the United States, arriving in Yorktown on June 5, 2015. Her subsequent cruise up the Eastern seaboard, visiting ports that played a key roles in the War for Independence, celebrate and reaffirm the long friendship between France and the United States. 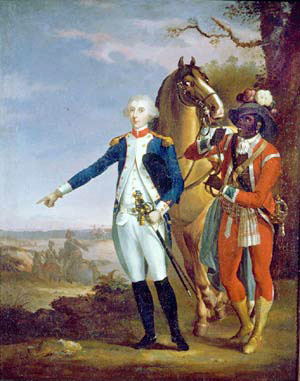 Lafayette with James Armistead, a slave whose owner permitted him to serve the “Hero of Two Worlds” during the American Revolution. 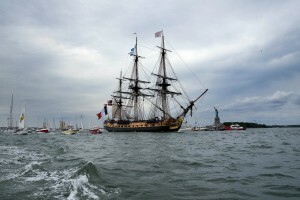 In addition to her goodwill message, Hermione’s voyage will pay tribute to the inspiring courage and moral example of a man known as the “Hero of Two Worlds”, Marie-Joseph-Paul-Yves-Roche-Gilbert du Motier, Marquis de Lafayette, whose arrival on the U.S. East Coast bolstered American morale and augmented forces at a critical time in the American Revolution. In addition to the history the visiting ship will revive, this ambitious project, more than 20 years in the making, exemplifies the Lafayette family motto, “Cur Non“, or “Why Not”. The Hermione under sail during sea trials in the Bay of Biscay, off the west coast of France in 2014. Here below is the unlikely story about how the Hermione—both the original tall ship, and its 21st century version—reached our shores, the first time in 1780, the second, two-hundred-and-thirty-five years later. Even before Spain’s Armada was blown off course in 1588 on its quest to topple Queen Elizabeth’s kingdom, Shakespeare’s “royal throne of kings, this sceptered isle” was known across Europe for its fierce nautical traditions. Over the next three centuries, England’s proud Royal Navy was inextricably linked to establishing a globe-encircling colonial empire. Except perhaps for the Dutch mercantile nation, with its own vast commercial empire lashed together thanks to a vast flotilla of warships and merchant vessels in the mid-1600’s, no other nation-state reached sustained nautical superiority over the British during Europe’s golden age of sail in the 17th and 18th centuries. In the case of France, it certainly was not for want of trying. From Bourbon monarchs during the ancien régime to Napoleon until Trafalgar, France sought to match its continental dominance with one on the seas through a well-financed mercantile and military program of shipbuilding. From the French realm’s Mediterranean littoral to the Bay of Biscay and north along the Atlantic coast to the Channel, her kings underwrote the construction of ports and forts in a bid for oceanic hegemony. Therein lies the origins of the French frigate Hermione, constructed in about five months in 1779-1780 in a purpose-built new town, Rochefort, established a century before during the reign of Louis XIV. It was French minister Jean-Baptiste Colbert, under the direction of his master the Sun King, who chose a suitable bend in the wide Charente River, 12 miles upstream from the Atlantic, to create an instant city whose sole role was to build France’s navy. There, in its protected spot where the English would never dare to attack, Colbert spent millions to create a state-of-the-art port, arsenal and shipbuilding center in less than a decade’s time. This 18th century view of the Corderie Royale shows the royal rope making building on the right, then the single-longest structure in Europe, more than 3 football fields in length. Rochefort’s centerpiece was the then-longest building known in Europe, the Corderie Royale. At almost 1,300 feet long, this magnificent structure was devoted exclusively to manufacturing rope. If France’s ships of the line and frigates required millions of feet of stout oak and other woods from her royal forests and pine masts from the Baltic, they also needed miles and miles of cords and rope of varying sizes and weights to manage a vessel’s numerous sails. Much as Norfolk and Groton are strategic naval/military ports to this day, from its inception in the 1680s until the early 19th century, Rochefort was France’s leading shipbuilding center. In constructing scores of wooden battleships and frigates, Rochefort became the country’s most potent symbol of France’s determined, seven-seas strategy to defeat its most imposing rival, Great Britain. Having ceded a vast part of its North American territories and much of present-day India to Great Britain in the treaty ending the Seven Years’ War between 1756 and 1763 (a worldwide conflict, in fact, and known as the French and Indian War in American history), France was itching for revenge. As the fight for independence intensified in Britain’s North American colonies, France upped the ante and officially signed a treaty in 1778 recognizing our independence. With that, the 13 colonies became a new battleground between Britain and France. Inspired by our quest for independence and looking for personal vengeance—Lafayette’s father was killed in the Seven Years’ War by the British—the 19-year-old French teenager first voyaged to America in early 1777. There, Lafayette soon met Washington and joined his senior officer staff as one the General’s aides de camp. But the ‘insurgents’, as American patriots were called at Versailles, were in dire need of French men and material in order to turn a largely defensive strategy of avoiding a direct battle with British troops into an aggressive thrust to defeat the invading Redcoats once and for all. 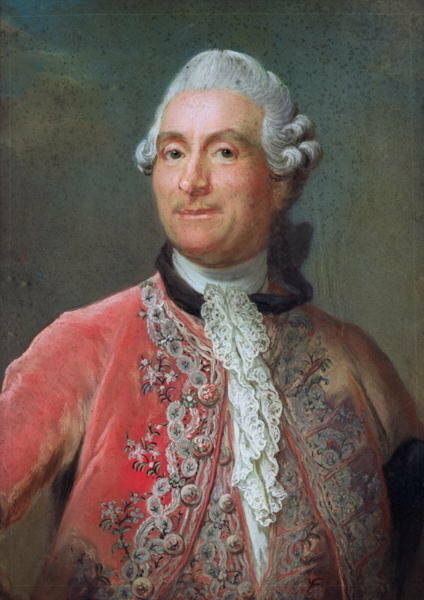 Comte de Vergennes, French Foreign Minister for Louis XVI, was instrumental in committing French naval and land forces in America’s fight for independence. In this effort, Lafayette proved to be one of the key personalities. Along with Ben Franklin, Lafayette helped persuade King Louis XVI and the Comte de Vergennes, his foreign minister, to send French soldiers and arms as well as engage France’s formidable navy to defeat King George III’s British forces in a desired joint land-sea campaign. In 1778, Lafayette returned to Versailles to cajole and charm Vergennes, Queen Marie Antoinette and the King to back the Americans against the British. To fully appreciate France’s underlying motive in spending millions to support the American cause, it should be recalled this theater of war was only one among several, and not necessarily the most important, as France battled to overtake Great Britain for worldwide dominance. From India to the Caribbean to present-day Canada and, directly south, from Georgia north to Maine, this was war on a global scale involving two bitter imperial rivals; it was, to lift a term from the 19th century, realpolitik writ large, involving men, arms and sea power as never before. In late 1779, on receiving approval from Louis XVI and Vergennes pledging both French Army and Navy support, Lafayette traveled to Rochefort, where a frigate was being built to take him back to Boston. This was the original Hermione, and it was this frigate that carried Lafayette with news, at the time, top secret, that France was increasing its support in a very substantial fashion by sending a full expeditionary force to America. In late March, 1780, Lafayette boarded the Hermione and sailed for Boston, arriving on April 27. With the involvement of French troops under Comte de Rochambeau and a timely and successful blockade of the Chesapeake Bay against a British Royal Navy fleet under Rear Admiral Thomas Graves, on the HMS Bedford, by the French West Indies fleet under the command of Comte de Grasse, who directed from his flagship, Ville de Paris, in late September 1781, everything fell into place for American and French forces on land and sea to undertake a pivotal siege of British forces under General Cornwallis at Yorktown. In 1836, Auguste Couder (1790-1873) created this painting entitled Bataille de Yorktown (“Siege of Yorktown”) which began on September 28, 1781. The painting is currently on display at the Palace of Versailles, in France. Lafayette can be seen to the right and just behind General Washington. 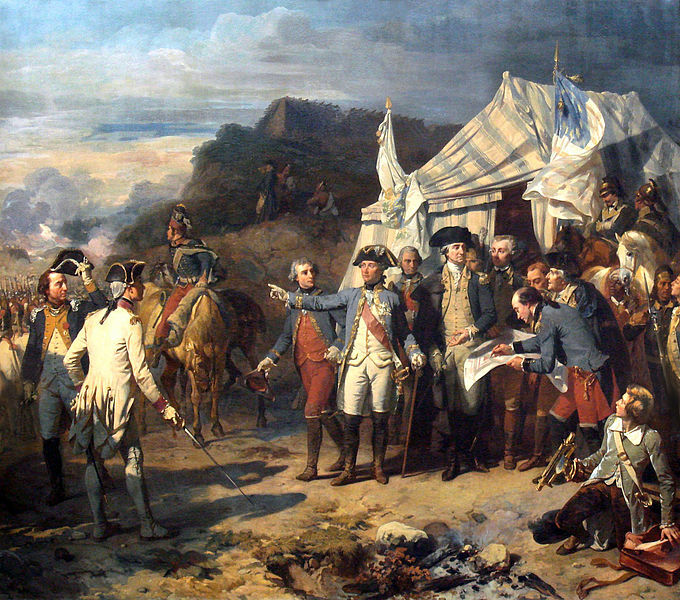 Rochambeau, commander of the French Army, is on Washington’s left, pointing toward the battle at Yorktown. British General Cornwallis surrendered to allied French and American forces on October 19, 1781. Blocked on from seaward and surrounded on land, British forces surrendered to the Americans and French on October 19, 1781. Acknowledged by historians as the tipping point in our campaign for freedom, Yorktown culminated in 1783 in the Treaty of Versailles, in which the British recognized our independence. At long last, then, the United States of America won its liberty, and by 1789, General Washington was elected our first President. “The idea was always to celebrate [the Hermione’s] role in the War of Independence. This project was conceived of partly as a historical venture, but partly to help generate employ- ment and tourism to Rochefort.”—Miles Young, President, Friends of Hermione-Lafayette in America. And it succeeded—more than four million people came to Rochefort see the ship being built and outfitted with sails and rigging. Thousands more came to see her off when the ship departed in April for her voyage to America. Fast-forward in time to almost twenty years ago, a small group of French men and women dreamed up the idea reconstructing an authentic replica of General Lafayette’s 18th-century ship in Rochefort. In July 1997, the Hermione-La Fayette Association was formed. For this non-profit group, it meant not only rebuilding the Hermione, but also reconstituting important elements of France’s maritime and artisanal heritage in the process. Achieving this grand ambition began rebuilding the Port of Rochefort, which had been heavily bombed in WWII and whose historic 17th century buildings, including the Corderie Royale, and 17th century-era port were severely damaged. Once the Mayor of Rochefort and the newly formed Association Hermione-Lafayette announced the goal, not only did French citizens come to enthusiastically support Rochefort’s revival, rebuild the Corderie Royale into a national museum, and reconstruct the Hermione, the regional government of Poitou-Charentes, in western France, also stepped in with additional financial aid in the intervening years, under the leadership of Ségolène Royal, then-President of Poitou-Charentes and currently France’s Minister for Ecology, Sustainable Development and Energy. Today, the majestic Hermione, is the largest and most authentically built Tall Ship in the last 150 years. And the efforts paid off. To date, more than four million visitors and tourists have visited Rochefort to see the Hermione; their donations, via ticket sales, have financed more than half of the 25 million Euro costs of reconstructing the Hermione. 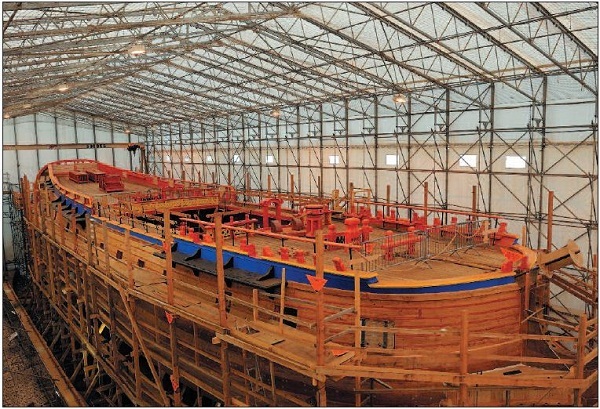 Plans for the replica ship were based on those of a contemporary sister ship that had been seized in 1783 by the Royal Navy and well documented by the British Admiralty. Like most replica vessels sailing today, concessions were made in the design to accommodate modern safety and sanita- tion requirements, and there is an engine room with an engine (two, actually) and a generator. Nevertheless, from the visitor’s standpoint, Hermione looks much like the original did and will be operated the same way as when sails were a ship’s only form of propulsion. The construction of the ship also served to revive the maritime skills and culture of the Age of Sail and, because all the work was done in the public eye, share that rediscovered heritage with the millions of visitors who came to see and learn. The keel, frames, and planking are all oak, shaped and built by the carpenters from Asselin Inc., a French company that specializes in the restoration of historic monuments. Hermione’s nineteen sails are linen (flax) with hempen boltropes and built by sailmakers Anne Renault, Alexan- dre Genoud, and Jean-Pierre Burgaud; they are machine stitched and hand finished, much like the current suit of sails made for USS Constitution and many other replica and historic sailing ships. Her standing rigging is hemp; running rigging is manila. A trio of blacksmiths hand forged the ship’s iron fittings, numbering in the thousands of pieces. The ship’s anchors and cannons were custom made at two French foundries. 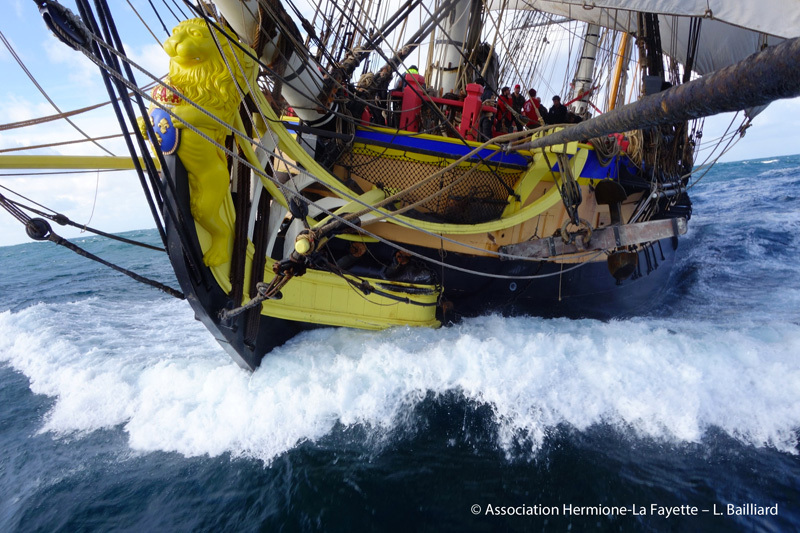 Hermione Voyage 2015 is part of an expansive outreach program featuring pier- side activities and traveling exhibits that will follow Hermione from port to port, as the ship makes her way up the Eastern Seaboard. There will also be companion Hermione-themed exhibits at the New-York Historical Society, the National Museum of the US Navy in Washington, and the Athenaeum in Boston. In June, Philadelphia chef Walter Staib will host a meal at City Tavern, the oldest tavern in America, where he seeks to recreate the meal that the Continental Congress feasted on with Washington and Lafayette onboard the Hermione in May of 1781. Finally, a full- featured website will expand the project’s reach to millions of people and will include an interactive, educational game, “Tides of Revolution: The Hermione Game,” to perpetuate the legacy of Lafayette’s voyage long after the ship leaves America and sails home to Rochefort, where she will continue her educational mission for future generations. 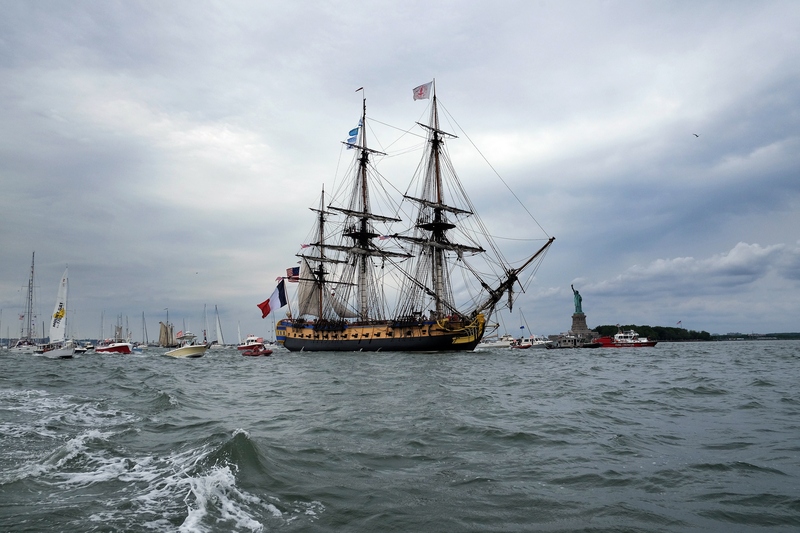 For more information about Hermione’s upcoming voyage and her US itinerary, visit www.hermione2015.com. David Lincoln Ross wishes to thank the Editors of Sea History Magazine to reproduce this article from its Summer 2015 issue. This entry was posted in American Revolution, France, French History, George Washinton, Hermione, Hermione Frigate, King Louis XIV, L'Hermione, L'Hermione fregate, Lafayette, Louis XVI, Uncategorized, Versailles, Washington, Washington and Lafayette and tagged #hermionevoyage. Bookmark the permalink.